Clover mites are accidental invaders that can be a temporary nuisance during early spring. These tiny, reddish-brown creatures have very long front legs and appear as moving dark spots to the naked eye. Sheer numbers, plus the resulting red-brown stain left behind if they are crushed, make them unwelcome visitors. Clover mites are not blood feeders and will not harm people or pets; nor will they infest household products. 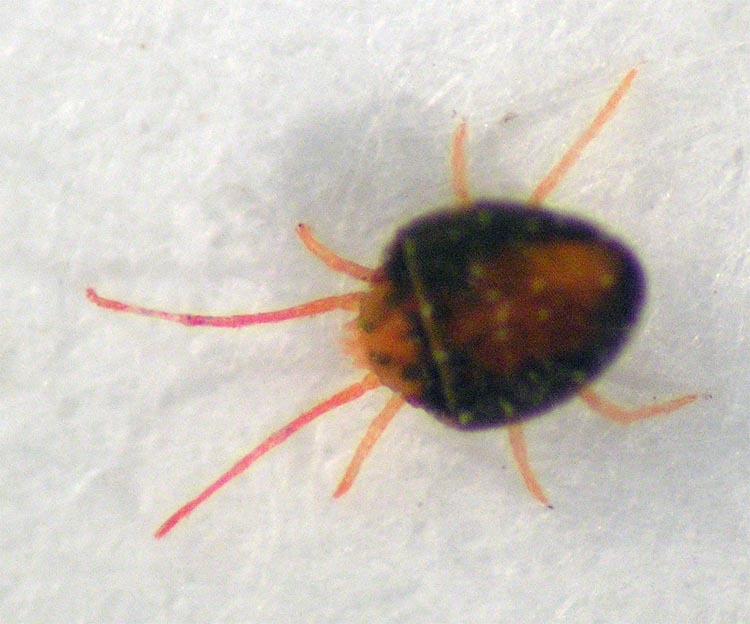 Clover mites that make it indoors will soon die. Clover mites (Figure 1) feed on clover and grasses. They can be especially abundant in the heavy, succulent growth of well-fertilized lawns during cool spring and fall months. They typically enter homes around windows or doors so these mites are usually seen crawling along sills or thresholds. A soapy rag or wet sponge can be used to clean mites from surfaces. Wipe carefully to avoid crushing the mites and causing stains. The crevice tool of a vacuum cleaner may also be used to pick up mites. Rely on non-chemical control indoors. Do not apply insecticides to kitchen counters or other interior surfaces. There is an increased potential for invading mites when grass extends up to the foundation. A plant bed or open area will provide a barrier that will stop many mites and provide a long term solution to persistent problems. Avoid over-fertilizing lawns. This creates situations that are ideal for mite populations to increase to tremendous numbers. Many mites may be removed from lawns by a strong hosing with water, but this will need to be repeated as necessary. A barrier spray of a lawn and garden pyrethroid insecticide (g., permethrin, cyfluthrin, or cyhalothrin ) may reduce movement of the mites from grasses to patios, decks, or house walls. Use a compressed air or hose end sprayer to treat at the base of all exterior doors, garage and crawl space entrances, around foundation vents and utility openings, and up underneath siding. It may also be useful to treat around the outside perimeter of the foundation in a 2- to 6-foot-wide band along the ground, and 2 to 3 feet up the foundation wall. Follow label directions.